Fry’s Peppermint Creams are a dairy-free and gluten-free product and are therefore, an excellent ingredient to use in low FODMAP sweet bakes and treats. After they’ve been melted down they also solidify well to create a sweet, minty layer that can be layered on top with chocolate. You could also use melted Fry’s Peppermint Creams to form a filling to sandwich between biscuits, such as in between shortcakes or empire biscuits. 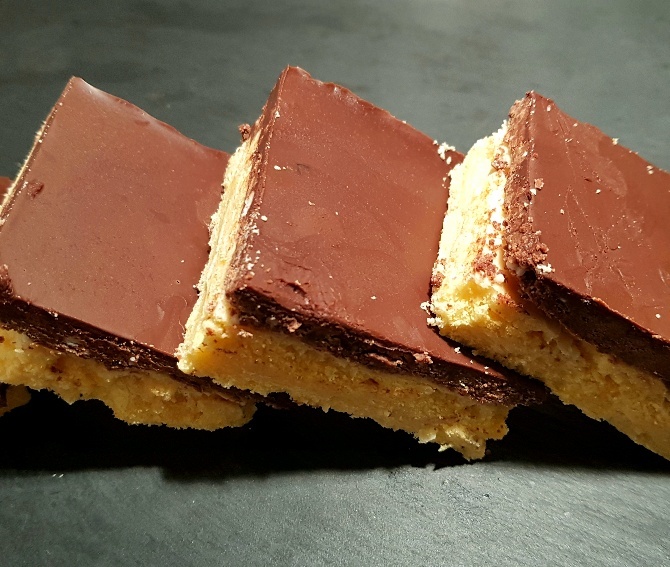 This recipe for chocolate peppermint slice makes 12 generous portions of traybake. Each piece is formed of a crisp and delicate buttery shortcake base that’s layered with gooey mint chocolate fondant and is topped with a decadent layer of smooth dark chocolate. Put it this way, it didn’t last long in my house. Lay greaseproof paper out onto a traybake tin . Weigh the cornflour, gluten-free flour , icing sugar, lemon extract and butter into a large mixing bowl. Rub the butter through all of the dry ingredients until it resembles fine sand. Add the rice milk and mix until a smooth dough is formed. Press the dough into a greaseproof paper lined traybake tin and bake in the oven for 12 to 15 mins or until light golden brown. Leave it to cool in the tin while you make the filling. To make the filling melt the 3 bars of Fry’s Peppermint Creams in the microwave, stirring regularly so it doesn’t burn, before pouring it on top of the cooled biscuit base. To make the topping melt the dark chocolate and once the filling is cool pour the dark chocolate on top and smooth it out. Cut into bars while still warm and, once it’s solidified, serve. I tend to make brownies as my go-to easy and fast gluten-free dessert. Definitely going to try out your recipe as a re4placement for that soon!